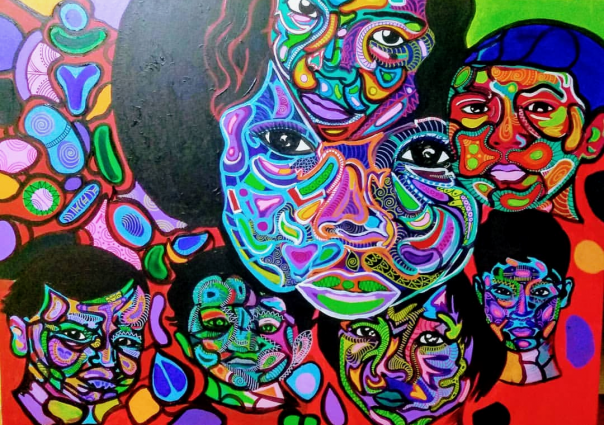 As art fairs continue to proliferate in South Florida from Miami to Jupiter, several businesses and community groups work to provide access for artists of color in Broward County. Art N Soul and C.R.E.A.T.E. recently presented the Sistrunk-A-fair, which ran Jan. 21-26, coinciding with Art Fort Lauderdale Art Fair on the Water. 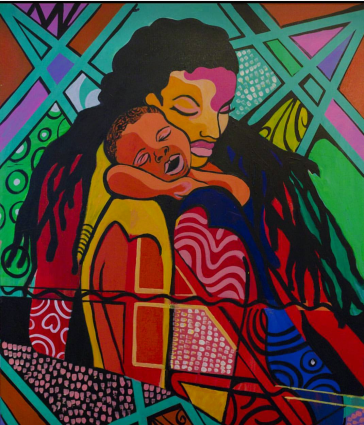 As part of that festival and mission, Huggins organized “We Love Art TOO,” an exhibition of local Black artists at the African American Research Library in Fort Lauderdale (2650 Sistrunk Blvd.). Additionally, during the week-long fair, several art events took place within the Northwest community of Fort Lauderdale, including performances and films recounting the history of Black communities in Broward. The Old Dillard Museum hosted the exhibition “The Beauty of Black Broward” featuring illustrations of Broward’s historic Black areas and displays highlighting James Sistrunk and Von D. Mizell (Broward County’s first and second Black physicians), actor Esther Rolle, the farmlands in Pompano Beach and The Palms Nightclub in Hallandale, a club that welcomed Black musicians during segregation. Artist Corinne Salmon, 37, of Pembroke Pines was one of the artists featured in the “We Love Art TOO” exhibition. 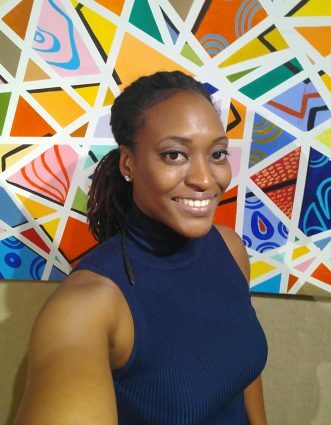 After graduating from Howard University, and with a newfound consciousness and appreciation of the African American contributions to the arts, Salmon was inspired to look for artistic means to express herself. And, she’s been using it ever since. 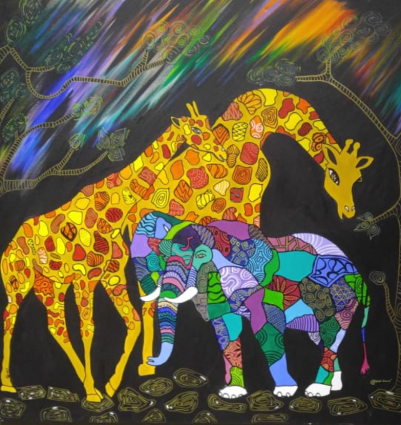 Her expressionist paintings feature a celebration of family life and animal motifs featuring bright colors and patterns used to evoke emotion. Salmon also doesn’t shy away from political or controversial themes. 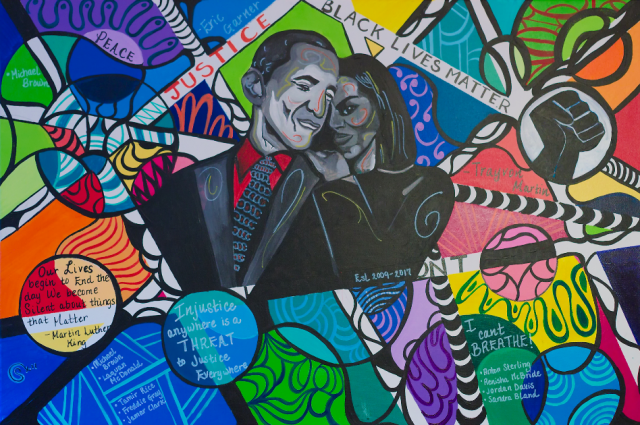 Her canvas, titled, “Obamas,” portrays former president Barak Obama and wife Michelle Obama in a loving embrace, while swirling around them in primary kaleidoscopic colors is the political turmoil of the times: Themes of Black Lives Matter, Trayvon Martin and the names of young black men who lost their lives to law enforcement officers, alongside inspirational quotes from Martin Luther King, Jr.
Utilizing animals to convey themes of spirituality, her painting, “Jungle Glory,” depicts two graceful long-necked and patterned giraffes along with a stylized bright blue baby elephant. Her use of bold lines and geometric shapes works together to create striking and colorful mosaics, reminiscent of mid-20th century expressionist painter Alma Woodsey Thomas, known for her exuberant pattern, rhythm and color. Like Thomas, Salmon shares a penchant for employing dense, irregular patterns of bright color contrasts. Salmon also includes photographer and printmaker Michael B. Platt, her professor at Howard University, “whose thought process was out of the box,” as one of her artistic influences. Working in her living room or garage, Salmon stimulates her creativity by listening to Billie Holliday or other jazz artists or paints to the beat of instrumental neo-soul music. Like attempting a crossword puzzle in ink, Salmon delves right in, without sketching first. She puts paint and brush directly to canvas. His 10’ photo of the Miami skyline at night is on display, along several black and white underwater photographs. · Marcos Conde: A native of Peru, his “Inner Vision” spray paint on canvas is an exploration of the relationship between mind, body, spirit and nature. · Nathan (Nate Dee) Delinois: Known for his large-scale murals in South Florida, his work combines a sense of whimsy grounded by urban visual elements. · Wilbert Simpson, Jr.: On display are his companion paintings, the Prince/Trible and the Princess/Trible and “Power” and “Beauty,” acrylic and canvas portrait of a woman’s face. > For more information, visit sistrunkafair.com.